Diagnosed with non-Hodgkin's lymphoma in 1993, Keith Brown spent the next year recovering. By December, the veteran of parts of four major league seasons, all with the Reds, felt he was ready to return. He also knew how lucky he was just to be in that position. "The doctors told me that 10 years ago, I'm a goner," Brown told The Associated Press in December 1994. "But I stayed positive throughout the whole ordeal. I'm not ready to hang up my shoes yet." Brown had been playing professionally in those shoes or other shoes since 1986, when he was taken in the 21st round of the draft by the Reds. He would go on to make the majors in 1988, the first of his four seasons where Brown would see time. He would also get a World Series ring. And, while he would make it back personally from his cancer for 1995, Brown wouldn't make it back to the bigs. He played four games with the Marlins' AAA team in Charlotte, ending his career. Signing with the Reds for 1986, Brown played that year in the Gulf Coast League and at short-season Billings, posting a sub-2 ERA between them. He also got a taste of AA Vermont that year. At single-A Cedar Rapids in 1987, Brown was even better, with a 1.59 ERA in 17 starts. He also went 13-4. He toured the Reds system for 1988, hitting AA Chattanooga, AAA Nashville and then Cincinnati by August. He made his debut with the Reds in Cincinnati Aug. 25, continuing what he had been doing in the minors. In seven innings of work against the Cardinals, Brown gave up just four hits. "Everything has just been going my way," Brown told The AP after the game. "I've been pitching pretty good, I've been having good defense to back me up. Everything's been going my way." Days later, against Pittsburgh, Brown came back down to Earth. In fact, The AP writer likened the outing to "Christmas in August" - for the Pirates. Brown gave up four earned runs and five hits. He also got just one out. "I just didn't have it tonight," Brown told The AP. In all, Brown started three games for the Reds that year, reliving in a fourth. He ended on another seven-inning, no-run effort. His overall ERA was a more-than-respectable 2.76. Brown went into spring 1989 looking for a more permanent job on the Cincinnati staff. Some even talked about him as a fifth starter for the club, or a long-reliever. "We'll just wait and see," Brown told The Sarasota Herald-Tribune early that March. "Believe me, I have not made this club yet. But I am getting a chance." He didn't make the club. He returned to AAA Nashville for the season, going 8-13 with a 4.80 ERA. He made it back to Cincinnati for eight late-season outings in 1990, getting called up in late July, then for the September stretch run. In eight relief appearances, Brown posted a 4.76 ERA. Brown returned to Cincinnati in 1991 and in 1992. He pitched in 11 games in 1991, filling in after Norm Charlton was injured. He then started two games in 1992, filling in for the injured Tom Browning. He signed for 1993 with the Royals, spending the season at AAA Omaha. He went 13-8 with a 4.84 ERA. But that was also the year he was diagnosed with his lymphoma. He was diagnosed in July. "I didn't know what to think, but I knew I wasn't going to lose this," Brown told a reporter in late December 1994. "Physically, I felt good." He underwent a complete bone marrow transplant. He got through it with the help of his wife Vicky. He also got all the way back to playing shape. He just needed to find a team to play for. This was also during the strike. Some teams called, but they wanted him to be a replacement player. But he didn't want to come back that way. He signed with the Marlins, on a minor league contract. 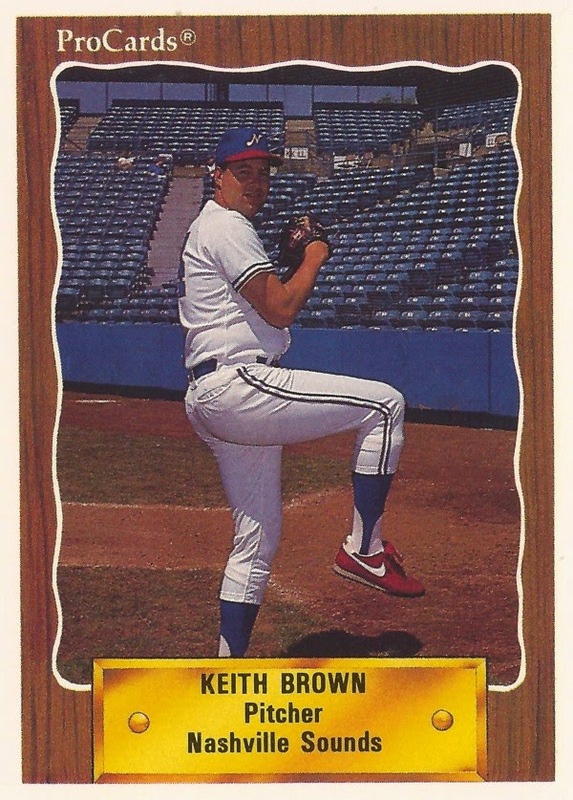 But Brown played in just four games at AAA, posting a 2.45 ERA, ending his career without returning to the majors. Bowing Green Daily News, Associated Press, Aug. 30, 1988: Reds fall farther behind L.A.